A Black Woman Did That! spotlights vibrant, inspiring black women whose accomplishments have changed the world for the better. A Black Woman Did That! is a celebration of strong, resilient, innovative, and inspiring women of color. With a vibrant mixture of photography, illustration, biography, and storytelling, author Malaika Adero will spotlight well-known historical figures and women who are pushing boundaries today--including Ida B. Wells, Madam CJ Walker, Shirley Chisholm, Serena Williams, Mae Jamison, Stacey Abrams, Jesmyn Ward, Ava DuVernay, and Amy Sherald. Entries on each woman or group will highlight their accomplishments, their world-changing words, and the ways in which their lives and actions have made the world a better place. 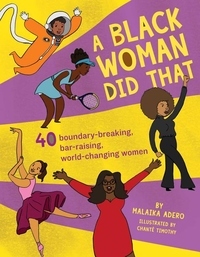 The book will also include a robust resource list of books, audio and visual recordings, and links, inviting readers, parents, and teachers to learn even more about the amazing black women featured in the book.